용암사는 기암괴석이 많아 남쪽의 소금강이라 불리는 월출산의 구정봉 아래 있다. 300평에 가까운 부지에 수많은 기와조각들과 주춧돌이 남아 있어 건물이 있던 자리임을 알게 한다. 1955년 ‘용암사’라고 쓰인 기와가 출토되어『동국여지승람』에 기록된 ‘용암사’임을 알게 되었으나 구체적인 기록은 전하지 않는다. 중심 건물터 남동쪽에 있는 이 탑은 일명 ‘탑봉’이라 불리는 바위 위에 세워져 있다. 전체의 무게를 받치는 기단(基壇)을 2단으로 두었으며, 그 위로 3층의 탑신(塔身)을 쌓아 올렸다. 둘레에 구역을 조성한 기단은 각 면마다 모서리와 가운데에 기둥 모양을 본떠 새겨 두었다. 기단의 윗면에는 높직한 괴임 2단을 별도의 돌로 끼워 두었는데, 이 가운데 1매가 없어져 1966년 복원공사를 하면서 새로이 보충해 놓았다. 탑신의 1층 몸돌은 2매의 돌로 구성하였고, 2·3층 몸돌은 각각 1매로 하였으며, 각 모서리마다 기둥 모양을 본떠 새겼다. 지붕돌은 1·2층은 2매로, 3층은 1매로 구성하였으며, 지붕돌 밑면의 받침 역시 1층은 5단, 2층은 4단, 3층은 3단을 두어 한 단씩 줄어들고 있다. 윗면 모서리는 석탑에서는 흔치 않게 두툼하게 표현하였다. 꼭대기에는 머리장식을 받치던 네모난 받침돌만 남아 있다. 1966년 무너진 석탑을 다시 세울 때, 아래층 기단에서 백자사리호 1점, 금동보살좌상 1점, 청자대접 1점, 사리 32과, 철편 11점 등이 발견되었다. 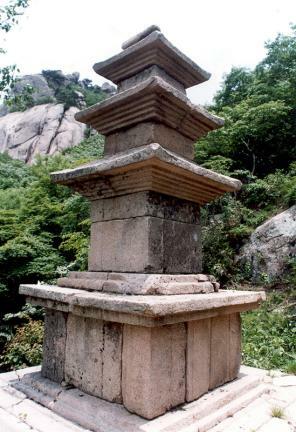 Yongamsa Temple is located below Gujeongbong Peak, Wolchulsan Mountain. 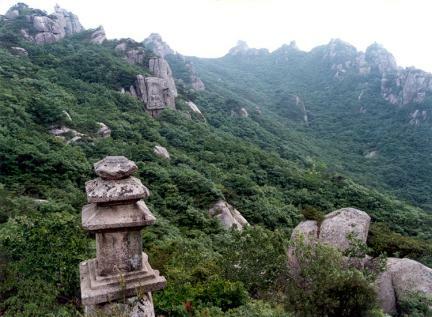 Wolchulsan is called Sogeumgang in the South due to the many grotesque-looking rocks. 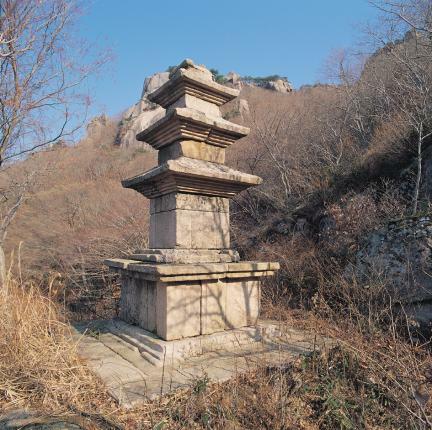 [Sogeumgang in Odaesan was named as such due to its beautiful scenery similar to that of Geumgang (literally meaning “diamond”)-san Mountain]. Many roof tile pieces and cornerstones left in the 990㎡-sized site point to the past existence of buildings. Roof tiles inscribed with the name of Yongamsa Temple were unearthed in 1955, indicating that it is the site of the one with said name as recorded in Dongguk yeoji seungnam (Augumented Survey of the Geography of Korea). No other details are available, however. 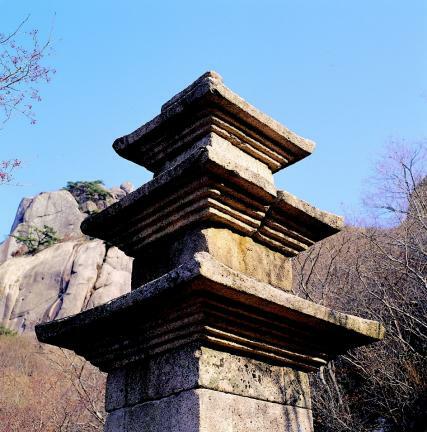 The three-tiered stone pagoda stands on a rock called Tapbong southeast of the temple site. 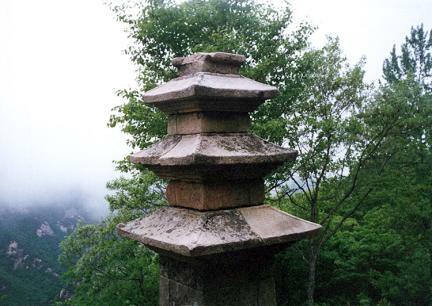 The stone pagoda was set up on a two-tiered platform. 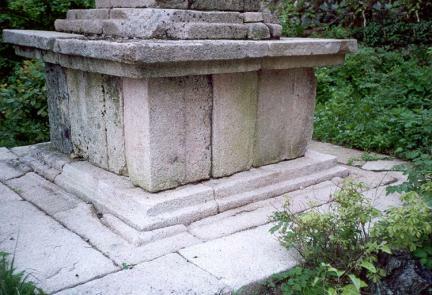 The square platform displays the shape of a column inscribed on the four corners and at the center of each side. Two tiers of stones are placed at the top of the platform. One of the stones used to be missing but was replenished during the restoration work carried out in 1966. The first tier of the body is composed of two stones, with the second and top tiers consisting of one stone each. Each corner of the body was made to look like a column. As for the roof stones, those for the first and second tier are composed of two stones each, whereas the top tier had only one stone. 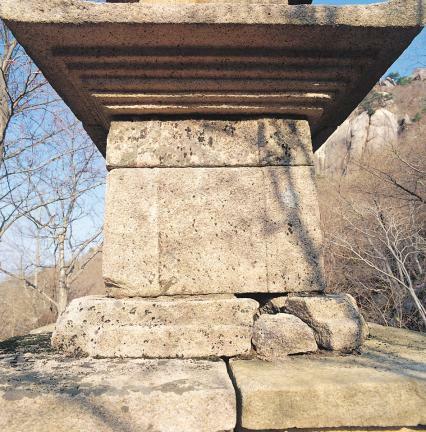 The bottoms of the roof stones are five-tiered (first tier), four-tiered (second tier), and three-tiered (top tier). 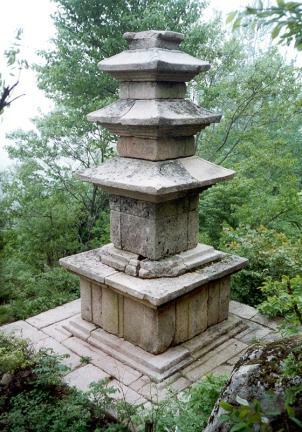 The edges of the roof stones are unusually obtuse for a stone pagoda made on the Korean Peninsula. 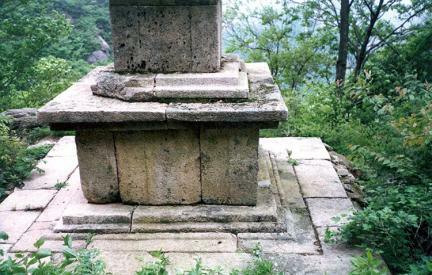 As for the stupa finial, only a square bottom stone is left. At the time of the work performed to repair the collapsed stone pagoda in 1966, the following items were found from the lower tier of the platform: white porcelain sarira jar, miniature image of a gilt-bronze seated bodhisattva, blue celadon dish, 32 pieces of sarira, and 11 iron pieces.